There is nothing like buying, owning and enjoying watches for inducing consumerist fervour in men. Perhaps the love of cars comes close; but, in watches we find something that enables us to tell the world who we think we are. Of course some disagree with this sentiment, and in a special way disagreement with it is also telling the world who you think you are. For example, we all like to feel that we are an individual, unique entity; someone with taste and discretion; someone who makes good choices; dare I say: someone stylish? But, how can we express this in the world? How can we don a marker for all to see? Well, of course, it is said with some justification that “clothes maketh the man” and I believe that a high quality watch is very much a part of that. It is jewellery for men and, for many men, it represents 100% of their interest in jewellery. Invariably it falls to this single purchase to settle the matter once and for all. However, watches are also a symbol. Not for nothing has the watch become the modern engagement gift given to a man. The lady gets a ring and the gentleman gains a watch. That watch prices can challenge even those of diamonds, for their stratospheric potential in bringing your bank manager out in hives and heaving fits, then this comparison is sometimes a financial one as well. The symbolism of a watch gifted is ripe and often used as the marker of some form of achievement or maturity. For example Army divers get given a CWC watch on completion of training (although I am told they mostly wear Citizens), Air Force fighter pilots are gifted a Gshock, and I saw many students gifted a watch by their parents on University graduation day. Movies follow this meme very closely. We all know Bond loves his watches, he’s a brutish gadget man of the highest degree, but note that he is always gifted his superwatch by Q. Similarly, Will Smith was gifted his Hamilton in Men in Black by his employer upon completion of selection. We also see lavish watch shots in movies such as the new Kingsmen, which even in the advert had a Bremont watch placement. No doubt the hero is given this watch at the moment he completes his internship and becomes one of the movie’s namesake secret agents. The watch is a select and special gift, limited in numbers, and marks the owner out. Those who only need to tell the time and don’t care too much about how this is achieved. This view wants as to pay as little as possible for the product that does the job. 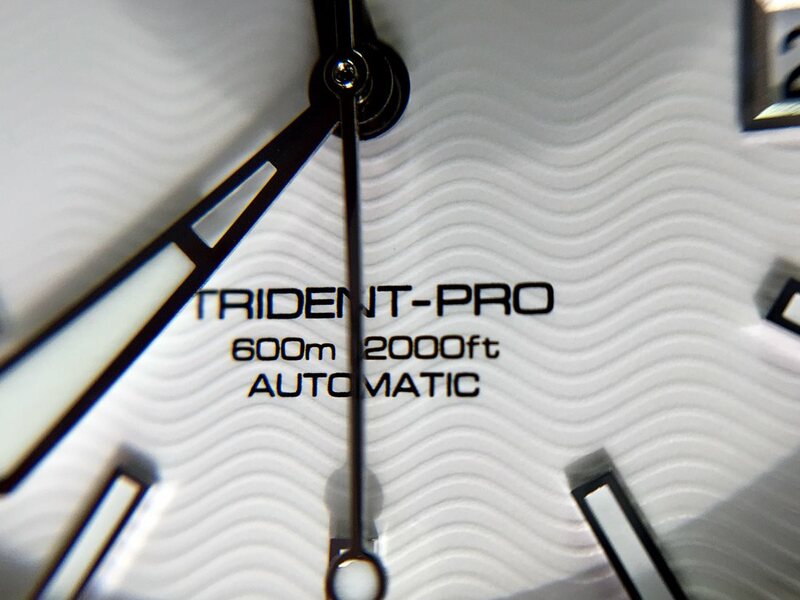 Those who find the design, engineering and precision of watches to be fascinating. This view wants to have a product of as highest quality as possible. 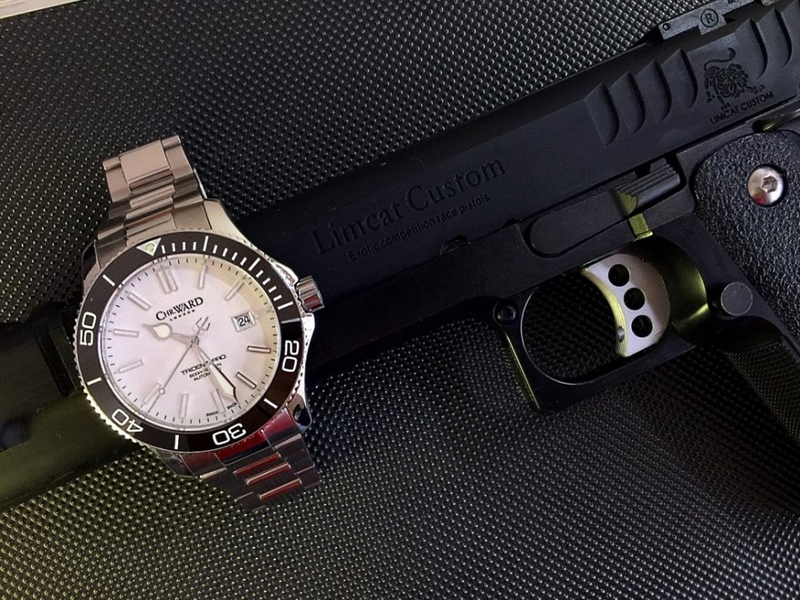 Watch manufacturers use the relationship between these two to control watch prices. To explain, any business starts as either a bespoke or a volume operation. As each cycle of the business comes around the board will often set the balance of the company’s finances (the rate at which money goes in and out) in such a way that the two values of Quality and Price go up. It has to happen slowly because if the Price hikes overnight, no matter the Quality of the product, sales will decrease as the customer will be able to buy what it perceives as the same Quality product for less elsewhere. This relationship works interdependently. However, the power of a brand (something that can be endorsed) is that it introduces Stickiness into this equation, which is simply the measurement of how likely the customer is to go elsewhere when Prices rise (or indeed Quality falls). 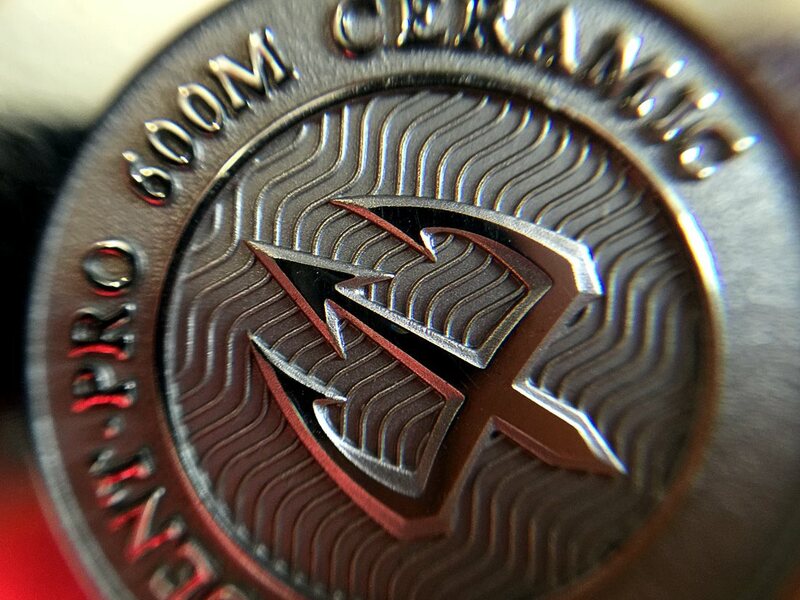 Eventually, over a long enough period and with very careful management, the Price of the product will rise high above its normal relationship to the Quality. This happens mainly because the client actively enjoys the product so much that he defines himself through the relationship to it. He is “stuck”. The Price can then rise to almost any level because the Quality is perceived to be in relation. Combined with a “limited supply” the price will rise even faster and stay high (a la diamonds). The upshot is that the high-end brands build their way to the top and stay there by inducing the customer to be a sticky and loyal brand advocate. For watch manufactures like Rolex and Patek Phillippe, this has now grown out of all relation to reality. Their stickiness is so high that they can effectively charge whatever they like for their product and people will still pay it as they have gained a legendary perceived reputation for quality. A perceived reputation mark you. With all that top-end profit they can, of course, actually make a quality product, but you have to ask yourself how much headroom there is in the price? This all flashed through my mind when I looked at my Sales Director’s new Rolex Submariner (that and the feeling that he was a git). Surely nothing else he could have purchased, no suit (who knows a good suit these days? ), no new shoes (Churches are ubiquitous), nothing else could have raised his personal style higher than a watch purchase. “Well,” he smiled, “when I found out how good a year we had”. I told you, symbolism and the perception of quality. Neatly tied together in a bow by the marketing machine of Rolex and priced to be scarce. I hate all that. I hate the feeling of manipulation that comes with the high marques. Indeed for me I am interested in only the point where quality and price are at the perfect balance. This I call the Golden Mean; the perfect point where you are going to get a higher quality product, but pay the smallest headroom for the intangibles; the terroir of the brand. 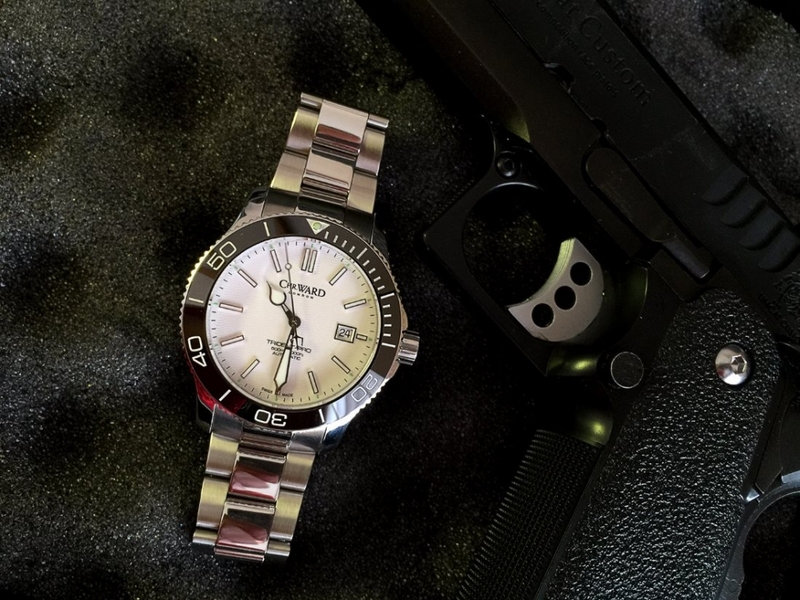 I want all the value to be in the design and build of the watch, not in the gimmicks of putting it on James Bond’s wrist, nor in the marketing manipulation of my perceptions. Particularly by Hollywood, although sportsman endorsements are just as galling. I want to do business with the Young Turks, these are the up and coming horologists who love what they do, who love the art in a watch and who are refreshingly small and thus cutting out the marketing dollar. It is a landscape with far more choice and the offer of a more personal relationship with the manufacturer not his marketing department. These are much more interesting foothills to be in and looking up, the peak of the mountain, with its small number of brands clutching perilously to the outcroppings at the top and clambering over each other for the flag, is not as far away as it appears. It’s all a trick of perception. With this feeling of getting more of what you pay for, we turn to the review. 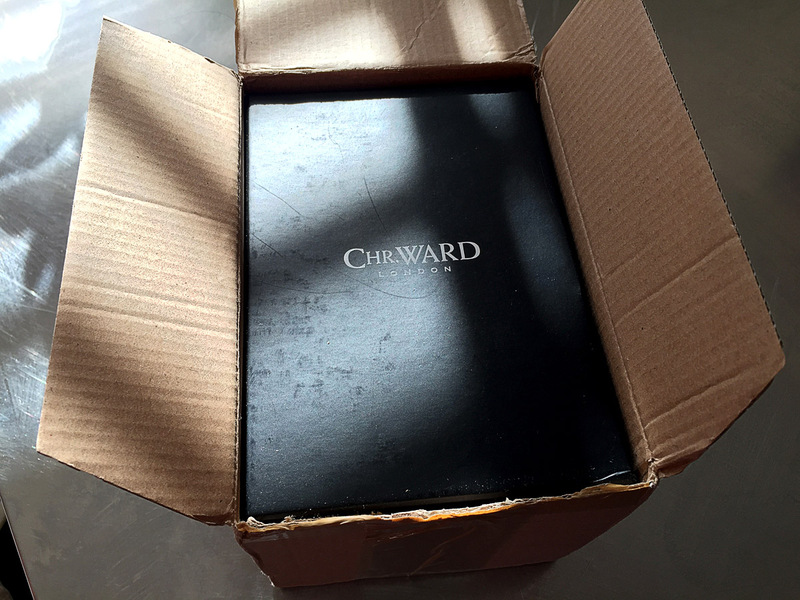 I have reviewed three Christopher Ward (CWL) watches since first buying a C4 Corax in 2007. That was my first introduction to the brand and a very exciting beginning. Since then I have owned many CWL watches, but it has been the dive range that has really got me excited. That sort of excitement that comes from getting a beautiful object at the right price. I took the Kingfisher, the granddaddy of CWL divers, all around the world and put it through more stress and strain than I thought possible. It laughed it off. On my return to England, and to mark a new career change, I bought the C60 Pro. This I reviewed as well on this site, and frankly, I have not been able to find anything approaching its Quality versus Price since. 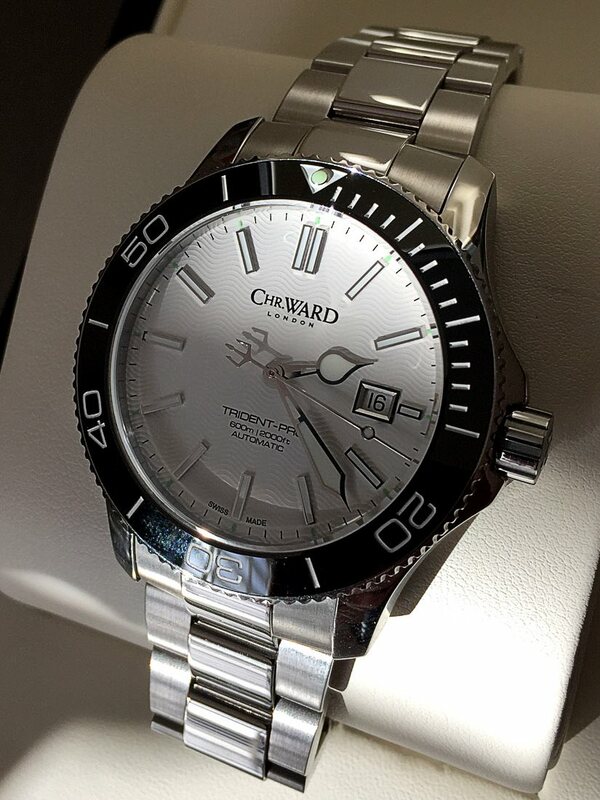 Christopher Ward has released a new version of the C60 Pro with some significant upgrades. These upgrades have been part of the general changes in quality going on over at CWL towers. 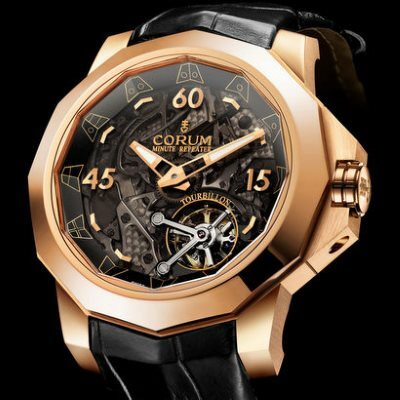 For starters, CWL has been bringing out some very high-end watches of late after teaming up with another horologist Johannes Janhnke. At least 4 watches were priced at, or around, 1500 GBP and one reached higher still into the 2k plus territory. This was a remarkable move for the brand. As I explained above, any business gently moves upwards in a natural progression and CWL had been moving up with the original C60, the success of which I was glad to play a small part in. However, it appeared that with this large jump to a post 1k standard price-range, CWL was attempting to go head to head with some perceived higher end makes such as Tudor (who also use the ETA movement). The reaction in the official CWL forums was one of shock. It wasn’t that people didn’t think these watches were good enough to challenge in this space, it was that this space was naturally one of more headroom in the price than strictly necessary. It was also out of the simple pocket reach of most of the regulars, myself included. This was feedback not lost on CWL, who have worked some engineering feats to bring those watches in the 1-1.5k bracket down to 995GBP. A welcome reduction in headroom and back to where the stickiness of the brand is at for the moment. As I said before, CWL is a rising brand and so now, more than ever, is the time to get on board before prices rise even further. 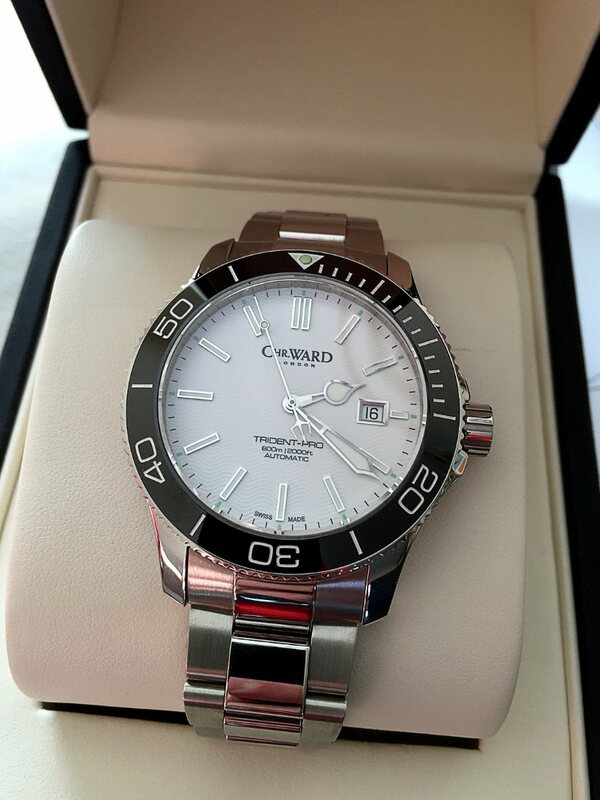 The main question then for this review to ask: is the new Christopher Ward C60 Pro 600 a significant enough upgrade from the previous model to deserve the price rise? CWL have worked up a large selection of new Tridents including movements in ETA 2842 / Sellita 200-1, Ronda 515, ETA 2893 (for GMT) and their “in house” custom movement of SH21 for the top model. This combined with two sizes at launch, and a host of colour and strap options, means there is a dazzling number of models in the collection. After much debate on the forums it was generally agreed that the red bezel/black face and the black bezel/white face models were the most pulse raising (However, I went for the white option). This variety represents CWL swinging for the fences and trying to please all bases. The lower end Quartz models will retain the customer loyalty of those either not sticky or not in pocket. 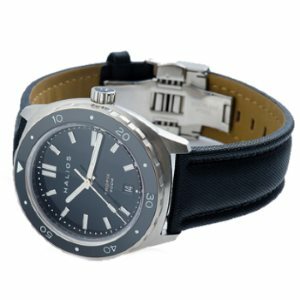 The high end SH21 movement continues the brand’s enhancement of its own cachet and the ETA/Sellita movement are the industry standard for this price range. Indeed also the price range above this as I explain in the section about movements. 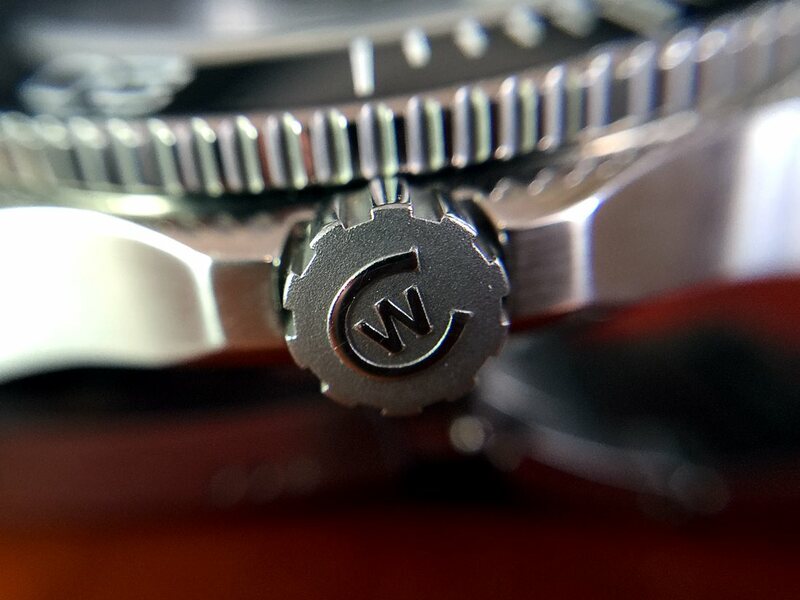 With our own in-house, 120 hour power reserve automatic Calibre SH21 at its heart, the C60 Trident COSC 600 is marked out immediately as something special. 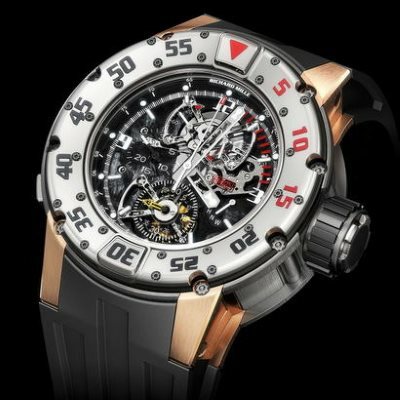 That this version of the chronometer is limited to a worldwide limited edition of only 300 pieces, the adjective “special” runs the risk of understating its importance. The engineering excellence of Johannes Jahnke’s ground breaking movement is matched by the superbly constructed all-new marine-grade stainless steel case which will keep Calibre SH21 dry as a bone all the way down to a remarkable depth of 600 metres (2000 ft). Not only that, the zirconia (ZrO2) ceramic bezel will be perfectly resistant to whatever knocks and scratches it receives on the way down. 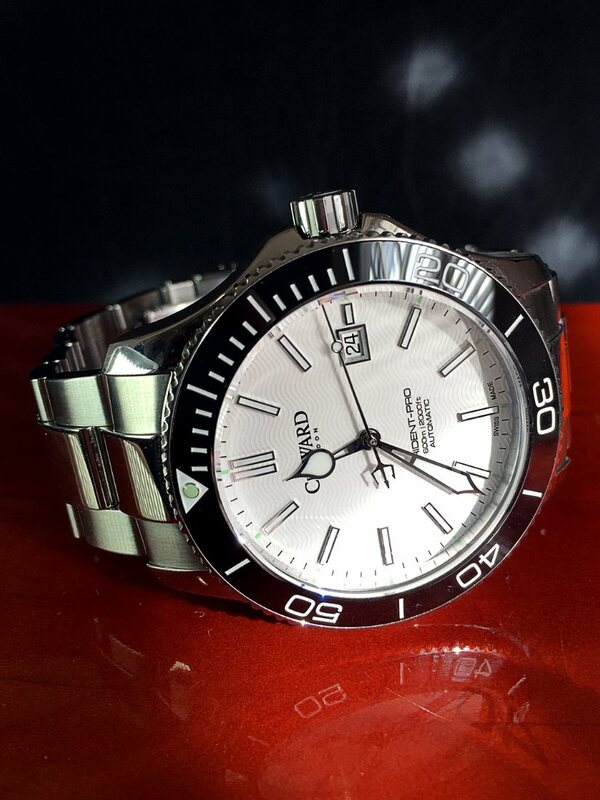 Of course, very few of us will test the C60 Trident COSC 600 to the limits it has been exactingly designed to withstand, but we will all relish the prospect of owning a watch as beautiful, rare and important. “Special” just doesn’t do it justice. With the SH21 you are getting an incredible 5 days of reserve power. Personally, running out of power is the most annoying thing about having a collection of automatic watches, and watch winders are very costly. 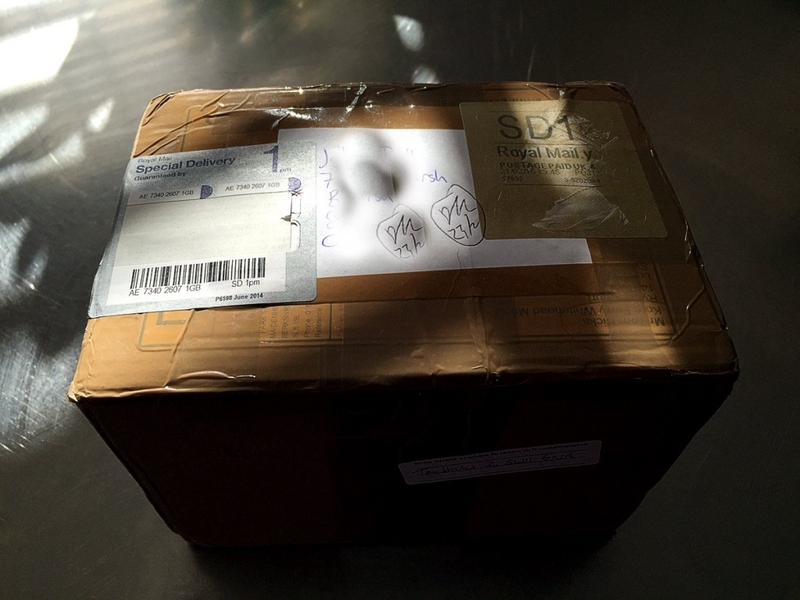 There is nothing quite like getting a new watch through the post. One becomes almost giddy with anticipation. The C60 Pro 600 didn’t disappoint! From a case point of view, ignoring the face for now, not too much appears to have changed. Lines may have been straightened a little in terms of tolerances, but other than the height, it doesn’t appear that much has been done. 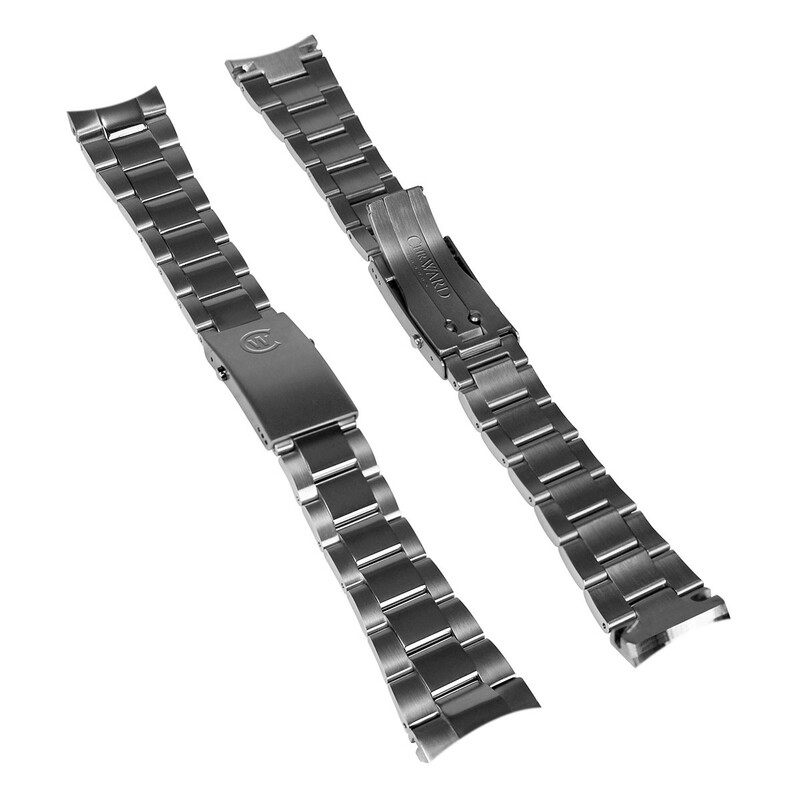 The part cut away to fit the strap is slightly shallower, meaning that straps will be a tighter fit. The area around the sides is slightly wider due to the difference in the back. Other than this I can only speculate as it’s not obvious. The face and bezel is where lots of changes can be found. Firstly, the date position has changed to the 3 position and this, more than any other change, makes my heart sing. The date on the old version was just out of true between 3 and 4 and this drove me to distraction. 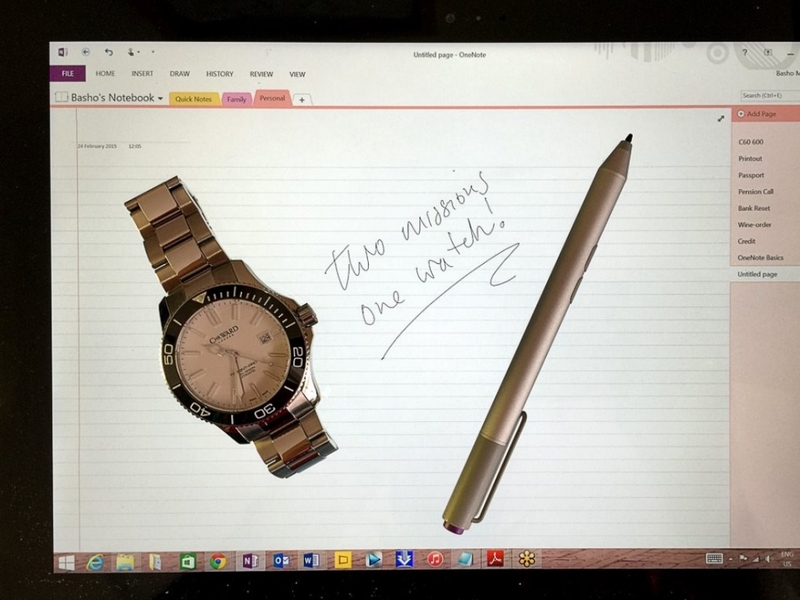 Also the markers, aping the Rolex design, have been changed to a more confident and classy baton type. They are also clearly defined with contrast colour around the outside. The small seconds marks between these batons have also been changed, which makes sense as the watch doesn’t have a chronograph. 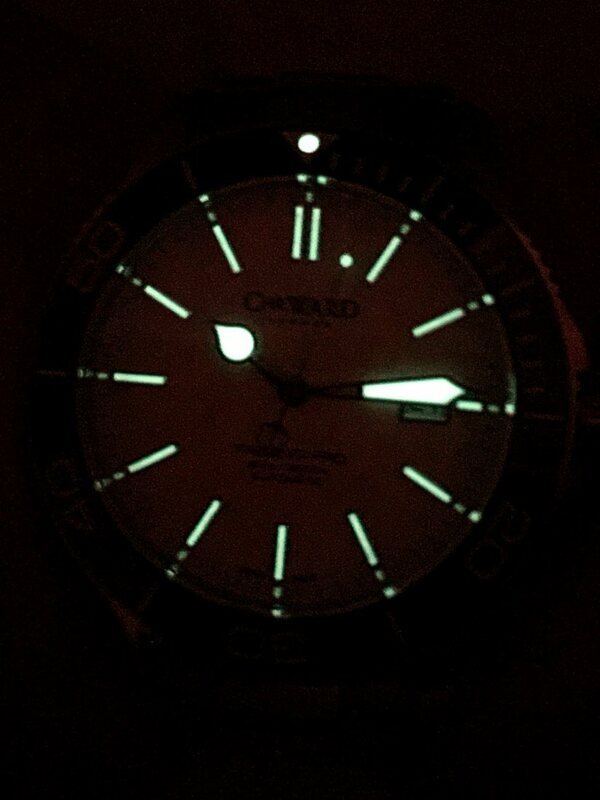 The second hand running around the face now has a proper dive marker circle of lume. This is an important element in the dive watch standards. The minute and hour hands of the C60 are again influenced by the Rolex and are pretty much the only direct influence left short of the style of the bezel markers. The result is a cleaner looking dial better using the spacing available. Moving onto the bezel, here the old version has been totally replaced by a much shaper cut edition in zirconia (ZrO2) ceramic. This is a much tougher surface than the older and should ensure knocks and dings are shrugged off. It also behaves much better at depths and temperatures and is shiny. The lume pip at the top is smaller and built to a finer tolerance, its containing triangle now doesn’t dominate the bezel so much. Looking at the crown, one can see that it has also been upgraded to a much better cut design that is easier to grip. The CWL logo on the end is clearer and polished. Clearly CWL has had the CAD designs out and have access to better machinery for cutting and polishing metal! The back is completely redesigned. As you can see on the back of my old C60, the image of the trident was etched onto the plate. I liked it, but it was not particularly impressive. The new case back is properly engraved with an imaginative design. It is thicker adding to the new depth of the case, but generally a serious improvement. Not that you will spend all that long looking at it. Let’s take a moment to talk movements. 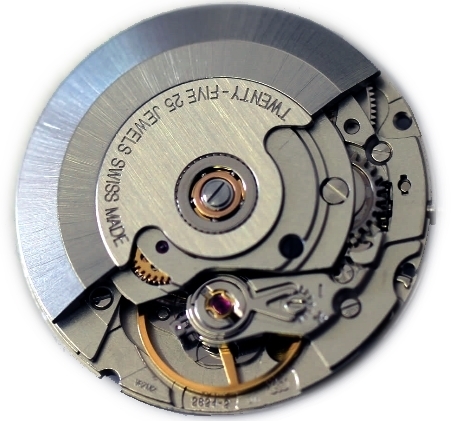 The ETA is the classic Swiss movement, used in countless watches. It is owned by the Swatch Group and they announced years ago that they would be phasing out selling the movements as separate units, leaving hundreds of companies scrabbling to find an alternative. This was an evil masterstroke by Swatch as the ETA movement had gained a stickiness of truly epic proportions. The most common model ETA, and the one possibly in the C60, is the 2824-2. This is the workhorse of the ETA stable. Rugged in its functionality. In fact one cannot really get away from it. Its perception as a standard means that many “higher-end” brands try very hard to distinguish their watches as having “modified” ETA movements. For example at Longines it is known as the L633 and noted only in small print, found 6 pages into their mechanical movement document, that the “base calibre” is the ETA. Hardly “in house”. Moreover, many other brands claim to have modified the movement, into a better one, but the truth is most simply order the movement with customisation extras directly from ETA themselves (blued screws, etc.) and have their brand name engraved on it. Even Omega did this shuffling (with the ETA 2892-A2) and suffered from being able to regulate the model (the Omega 2500 sometimes just jammed). The main industry response to the Swatch announcement was to work with some of the companies that completed ETA movements on their behalf. One such company was Sellita, who are a Swiss movement maker who finished ETA movements for ETA to sell as their own. 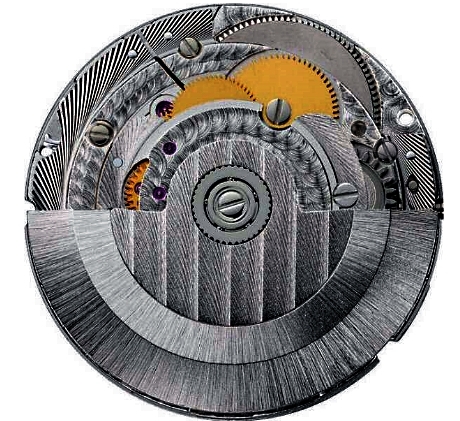 Being owners of all the required equipment, they changed one tiny thing from the ETA movement and released the S200-1 that may be found in any CWL automatic movement watch. What is the effective difference? None. 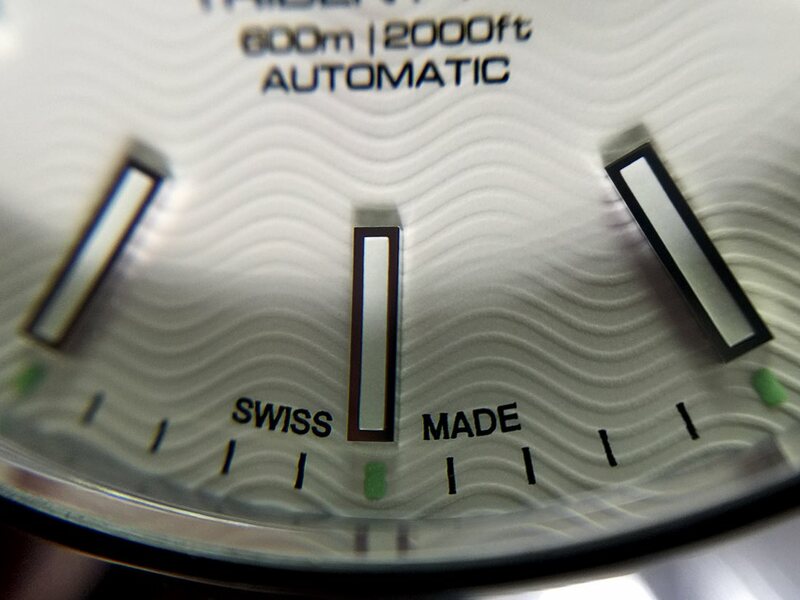 Both movements could be made in the same factory, both are Swiss, both are accurate in the same way and with the same tolerances. 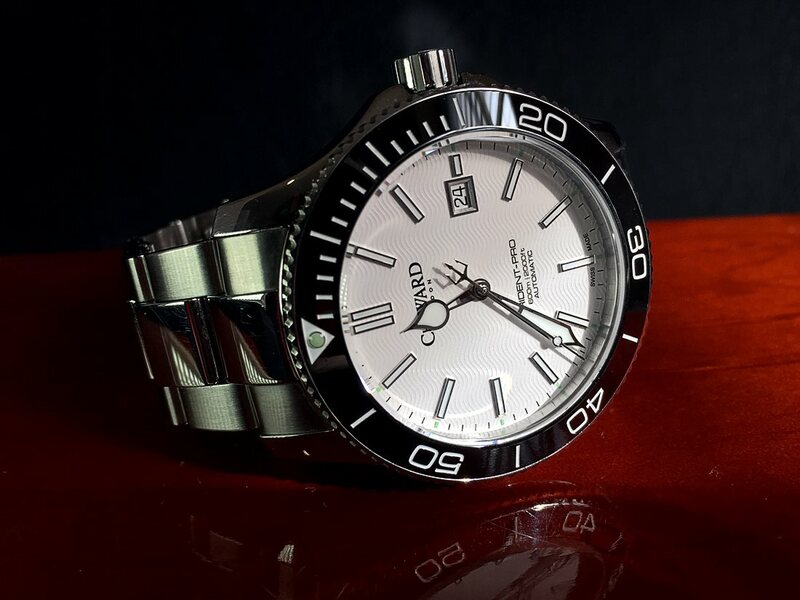 It is a fine example of brand perception that I have heard all sorts of made up stories regarding Sellita such as that they are Chinese – they are not, that they are for cheaper brands only – they are not (Oris uses them as their calibre 633) and that they are not the same quality – they are identical in quality and a Sellita can gain the CSOC certification just as well as an ETA. Suffice to say, whatever is in my C60 Pro 600, I am satisfied that CWL will have regulated it properly and not hidden that they use ETA/Sellita by scraping a Dremel over it and calling it a modified “in house” movement. diving watch must have a number of features to be of use beneath the waves, but all recreational divers will have been taught using a dive computer for most of the vital ones. Thus, the dive watch is somewhat of a reserve device. Moreover, the markers set to 15 minutes times are anachronistic, being based on obsolete Navy dive tables form the 50’s (they still work as a countdown timer of course). So is the possibility of being able to go down 2000ft as the record is 1700 or so (between 500-600 meters) in the open sea from a Comex diver in the 80’s. But, don’t let this dishearten people who want to actually take a watch diving. I am friends with an Army diver and he certainly uses a watch as backup and laughs disdainfully at the PADI dive tables. In civilian diving terms the ratings are best judged as 30 Atmospheres (300 meters) being the base standard for scuba diving, which is what the CWL Kingfisher was rated to and I dived 15 times in the sea wearing that watch. For serious, professional or prolonged diving the rating found on the C60 Pro 600 is more than qualified being rated to 60 Atmospheres (600 meters – hence the name). 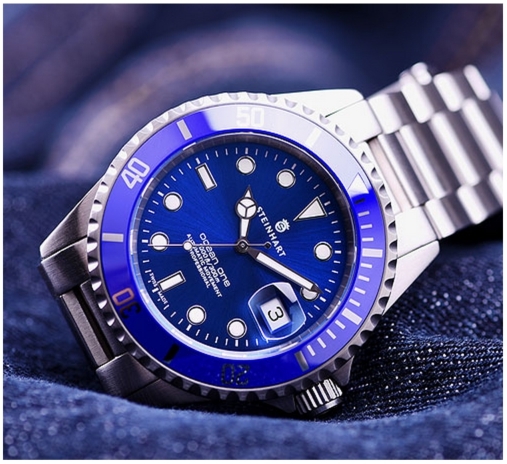 Any further depth ability would probably necessitate a domed glass to prevent glass blow outs and it is a serious achievement to produce a watch that can dive to 600 meters rating. 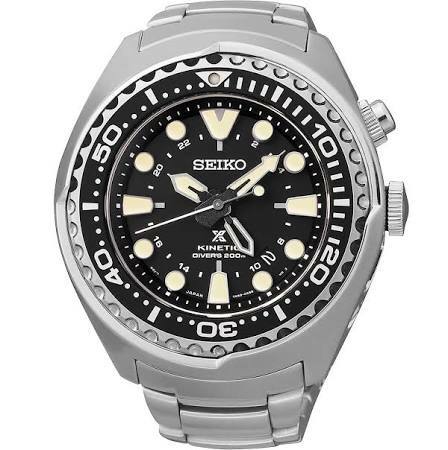 There are all sorts of professional ISO standards for diving watches, which require such things as anti-magnetic abilities. Chris Ward confirmed via email that while the Trident series hasn’t been accredited against these standards, it meets or exceeds them. 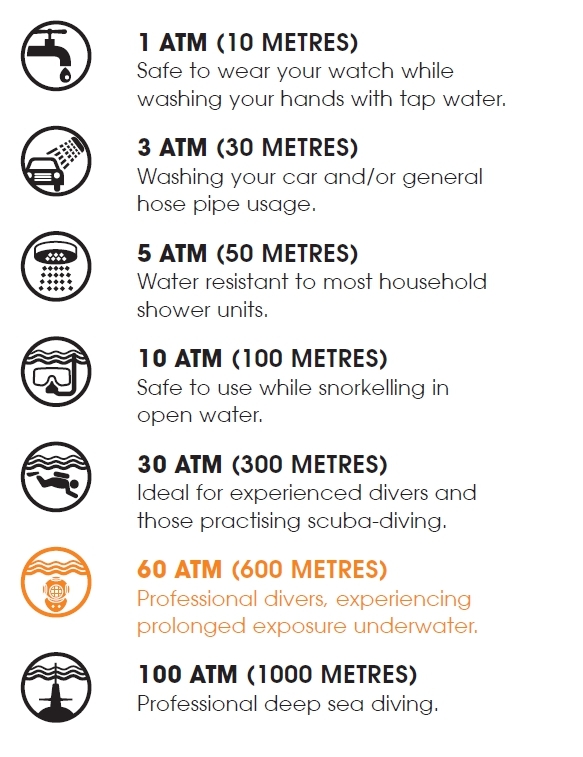 However, I would take a dive computer as well, one is usually part of your rental and required to properly workout dive plans anyway. One item on the new watch that will be real use under the sea and at deeper depths is the new dial markings and luminosity. Colours are one of the first things that change under water. In clear water light cannot penetrate very well and only 20% of sunlight reaches below 10m the rest having been scattered. Different colours simply stop being visible because they rely on reflected light at a certain wavelength. Red goes first, then orange, yellow and finally green at around 50m. 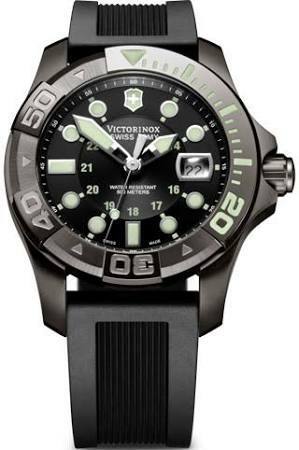 Having clear, bright hands and markers, not to mention the upgraded SuperLuminova, which glows bright green, means it is possible to clearly read the markings at serious diving depths. Luminova does fade over time however, so a torch is another vital bit of diving equipment to quickly recharge the lume should it be unclear. I will be diving in the C60 Pro 600 in June and I will report back my findings. Obviously, the C60 being an update is most heavily influenced by its predecessor. 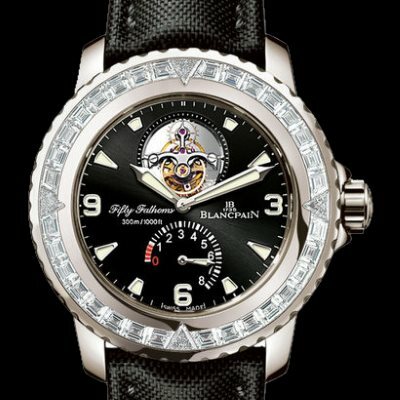 The movement of the date to the 3 position rebalances the dial as does the change to lined indices all around the face. 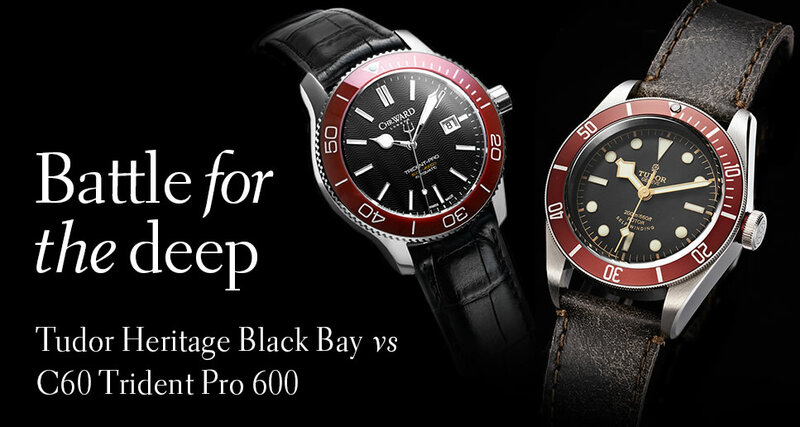 Comment around the web has focused on its similarity to other brands around the same cost, particularly the Halios Tropik SS which has a ceramic bezel, but I feel that this is slightly unfair as the C60 is aiming its sights much much higher than the Tropik and is larger and with a superior mechanism, not to mention case quality. The main watch the C60 is aping is the Rolex. 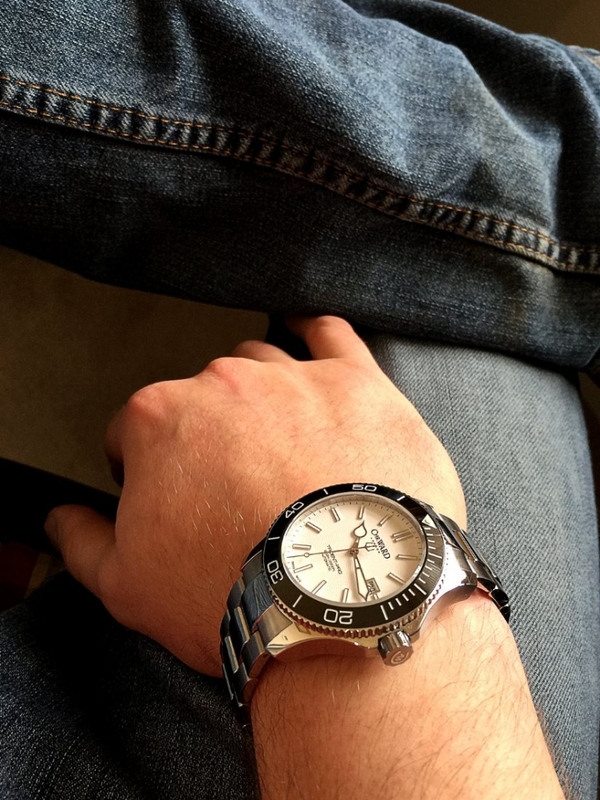 Dive watches are possibly the most incestuous of watch types. A few large marques nailed the early usage models with bezel innovations and celebrity endorsements or even by getting a watch issued to a particularly “cool” military unit. A sort of “manly men doing manly things in our watch” promotion. Here James Bond raises his head again, of course, as Hollywood follows the meme into the world of fantasy. The thing is that since then pretty much no one has innovated anything game changing. It’s got so bad that when I Googled to find the “Top 10 Dive Watches” I got the following hideous models. How could anyone seriously consider these the best? They are at best “desk divers” and at worst something to give one nightmares. Like something dragged up from the bottom of the Mariana trench and, in my opinion, should be instantly thrown back to sink without trace. Indeed. 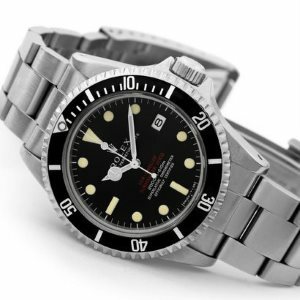 Well, in all honesty the Tudor is also influenced by the classic Rolex along with everyone else. 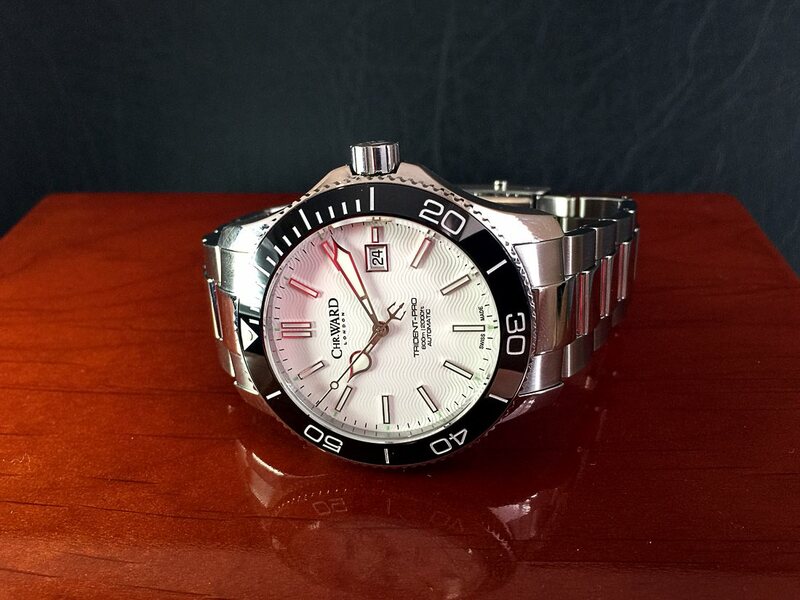 After all Tudor is owned by Rolex and has access to the designs first hand. Moreover, the Tudor Black Bay won European Watch of the Year, narrowly beating CWL’s WorldTimer to the podium (narrowly enough to be commented on by the judges). The big difference is value. The Tudor has every penny of headroom that Rolex can squeeze into the price and is heart freezeingly expensive for an ETA based watch, coming in at 18 hundred “doubloons” as the CWL ad makes plain. You can keep it. I am immune to your sorcery. The truly best dive watches are the ones used by divers, and here we find that pulling out a simple tool watch that works is the key. The CWL C60 Pro 600 has every feature required to gain a confident nod from the dive master when you step aboard a boat. For those not on boats it becomes wanting to wear the dive watch style for its pure, simple and elegant aesthetic. It is here that most will be used, worn and loved. Dive watches step between worlds exceedingly well. They don’t have the wannabe aspect of some other types (army watches for example); but, rather gift the wearer with the ability to pull off the look as easily in jeans as in a suit. I see lots of dive watches in the city, more than dress watches to be honest. 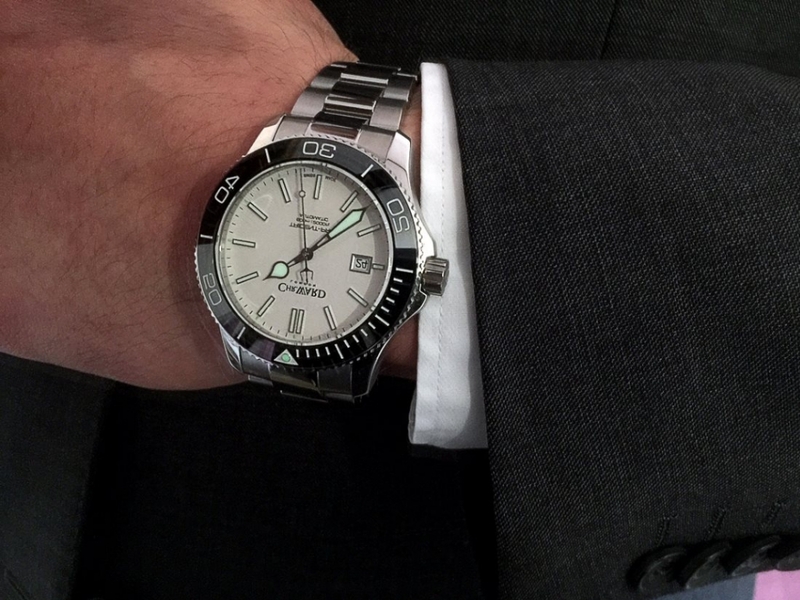 Even at the very top end of the market, it’s the dive watch that get brought out. I had a client in my office the other day wearing a Patek Phillippe Nautilus that comes in at 40 thousand pounds and he sat around the table from my Sales Director in his Rolex and myself in the CWL. I don’t think it looked out of place sitting in the room with two of the greatest watches ever made. In fact, it worked really well. After we left the room, my staff and I exchanged looks and whistled in appreciation of having that sort of watch budget. Myself, I don’t have a house deposit to spend on a watch and wouldn’t do so if I did. The Patek Phillippe has so much headroom in its price that the Golden Mean is not even visible on the chart anymore; being so far below. I’ll stick with the CWL. 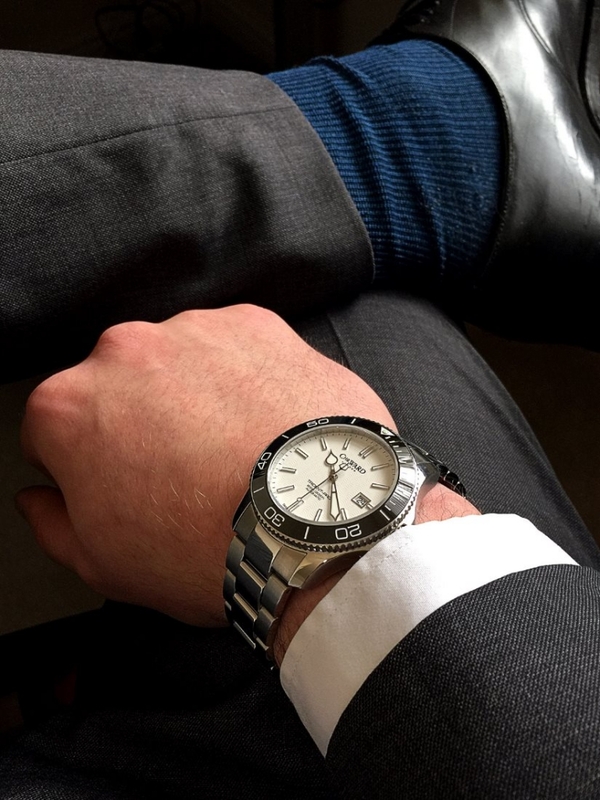 I think, in the end, that the reason so many dive watches are worn with suits is because people who have to wear suits to work are often better paid and the sorts who go recreational diving in the first place. Of course, this is to generalise; but, there must be some reason for it beyond the stylings. Incredible isn't it? Truly a work of art. 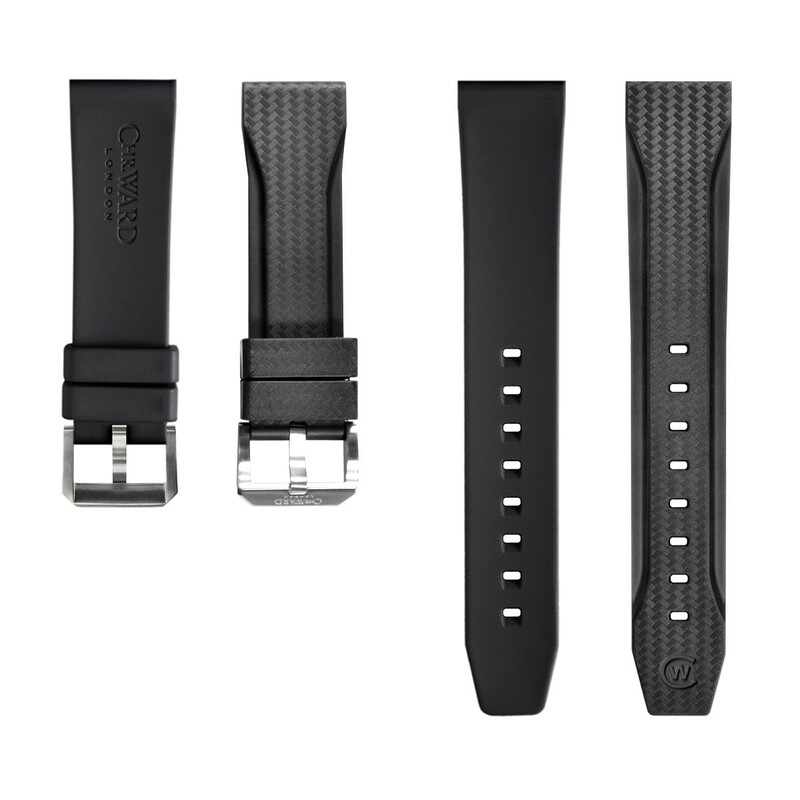 C WL has issued a number of high quality straps for use with the C60 Pro 600. 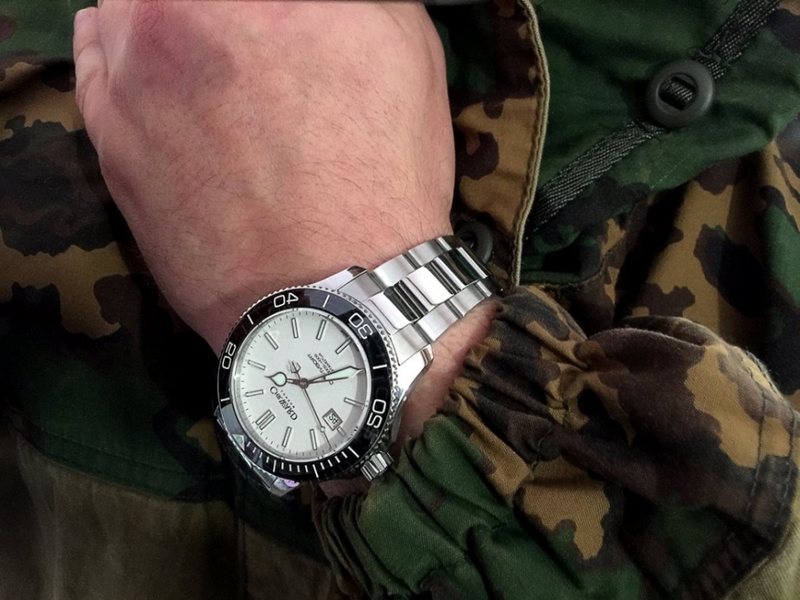 Natos enhance the military aspect of the watch and enable some extra safety against watch loss and the ability to fit the watch around wetsuits, etc. The steel strap has a very nice dive extension and is one of the best Oyster style straps I have seen. I have no inclination to swap out for a 3rd party one, something that I would normally do in a heartbeat. This is a good job because I have never had a strap that was so hard to remove – definitely leave it to the professionals. 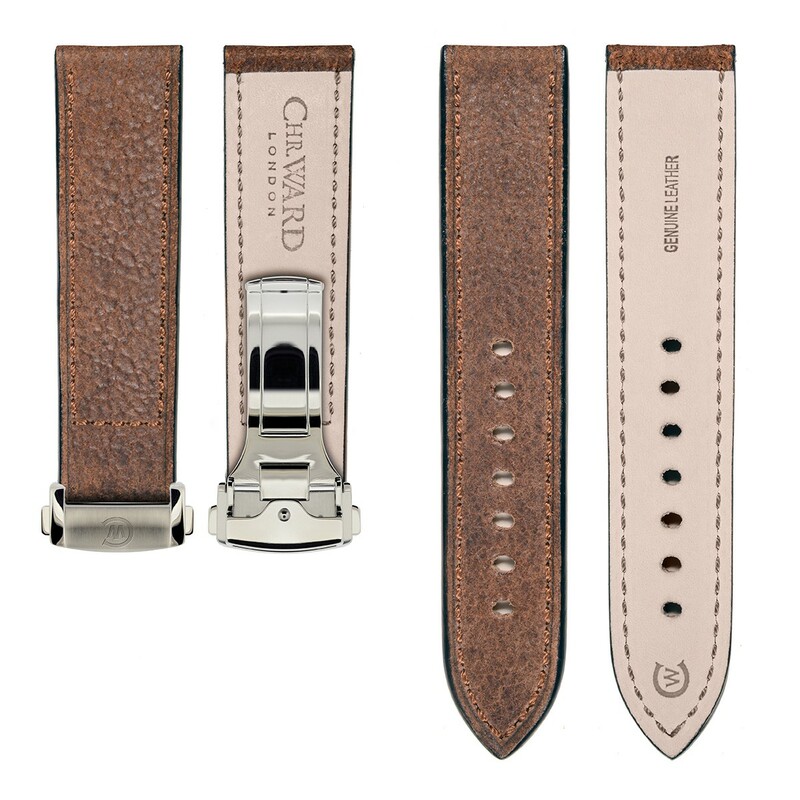 The leather strap is a matter of personal taste. CWL do an excellent version for use with the C60 Pro 600, but I have the sort of arms that destroy leather in a matter of a few months. I usually change out my watches for a strap by Hirsch that has rubber on one side and leather on the other. These are, in my opinion, the greatest straps in the world, but I know leather is a very personal choice. The CWL would go well on almost any style, from distressed (like the Tudor Black Bay), to light brown. 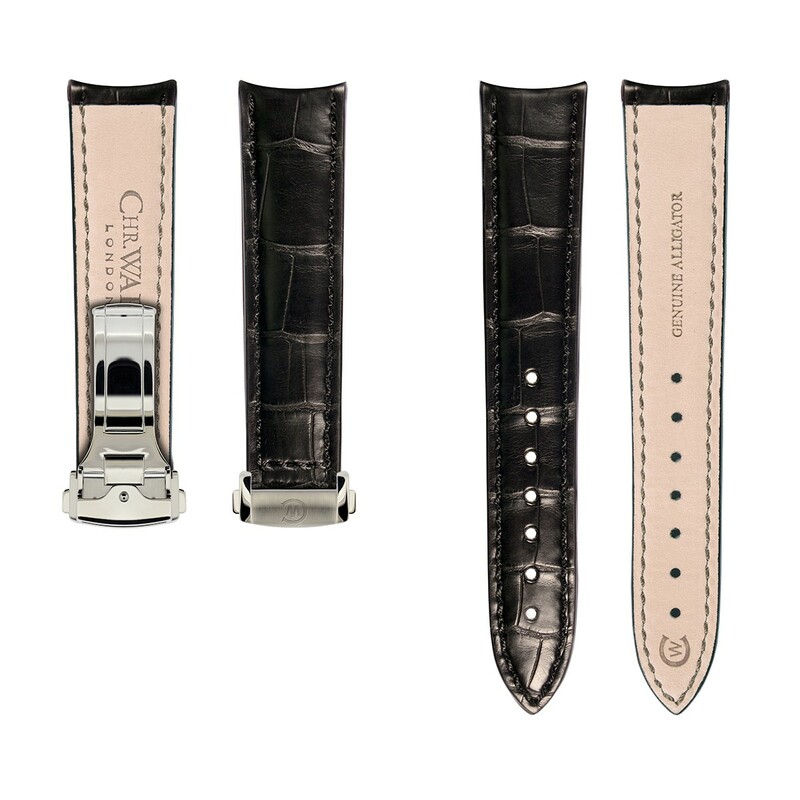 CWL also has the option to upgrade the strap for real Alligator at time of purchase and if you don’t possess a strap tool kit then I suggest you consider having this service done for you by CWL to ensure no mistakes. The alligator strap is incredible and probably the finest strap CWL has ever produced. At this price there are a lot of watches to consider and many have at least one of the features of the CWL. This lovely looking blue watch is a top end version of its homage, read total ripe off, of the Rolex Submariner. 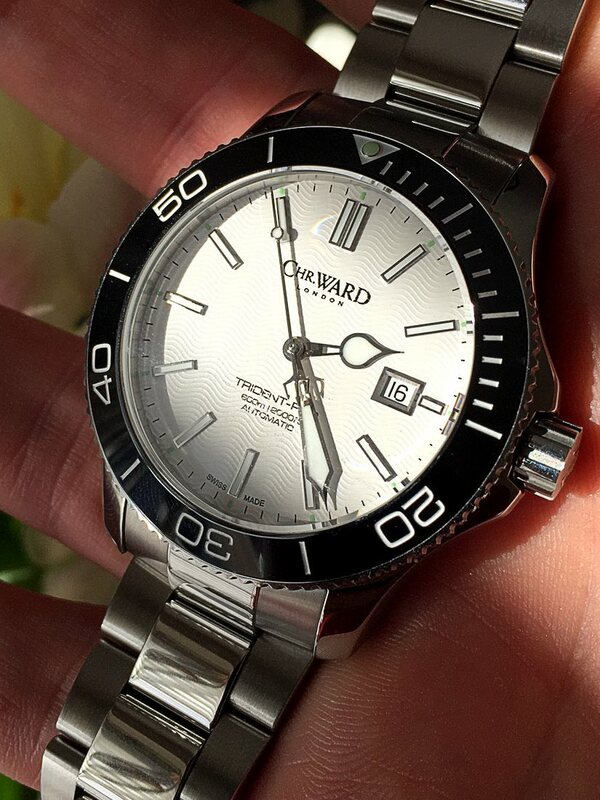 Of all the watch makes to face criticism regarding influence, Steinhart just go for it in a way that few other have the Germanic balls to attempt. However, don’t be surprised if people actually do mistake it for the Rolex and that you will have to, abashedly, admit that it is not. I know, I owned one. Steinhart make the sort of Rolex you expect German engineers to make, a sort of brutal, tank like industrious timepiece. No nonsense at all, which also means – of course – no passion. I own a Prospex, but this is a pilot’s model with a slide rule used mainly when I am travelling. The dive models are nice and definitely unique, however they are of a size beyond size; like laying a Dune Sandworm across one’s wrist. Not everyone can wear one and forget it with a suit. The quality is there through and some professionals use them. These are nice and follow the clever design aesthetic of the brand very closely, however, again, not really an everyday or city watch and something to come out at weekends or when on the water. I eventually decided that as good as they are, they are not “classically” good. 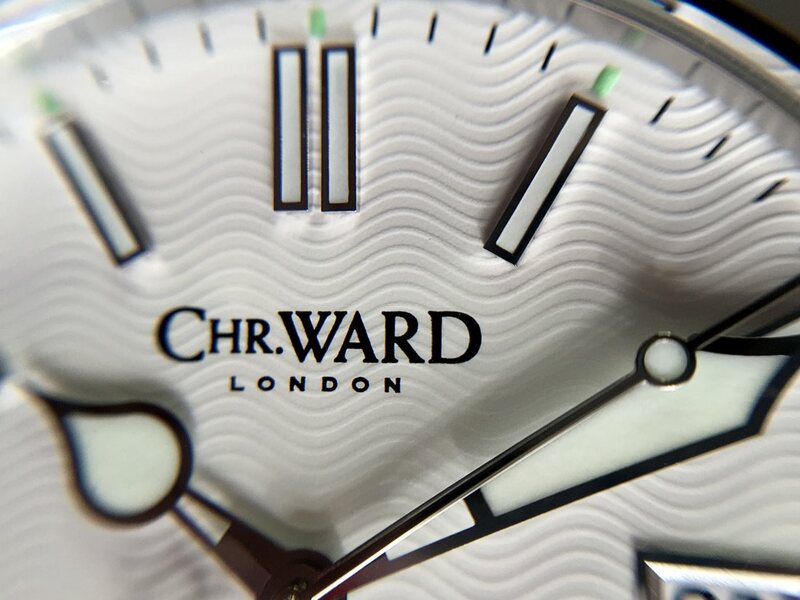 We believe that ethics and morality in business are critically important and do our very best to ensure, wherever we can, that Christopher Ward operates to the highest standards in these areas. For instance, we only use conflict-free diamonds in our diamond watches that are traceable via the Kimberley Process and our alligator straps are from managed farms that are signed up to the United Nations CITES (Convention on International Trade in Endangered species of wild flora and fauna) certification scheme. It helps that we are a small company and that we know all our suppliers personally and visit them regularly, however, as a young company we also recognise there is still much to be done and that a process of continual improvement is vital if we are to succeed ethically, morally and ecologically. We are committed to developing an ethics programme using the guidance of The Institute Of Business Ethics (see below) that will help us live and work by standards that we and our customers expect. That alone would always make him a contender, but add that he makes some of the most stylish British watches and I will always put his brand at the top if the list. Not all his watches are home runs, some of the women’s ones are a definite miss, but he stays away from being too closely a homage and that is an important thing. The brand is solid. The watch itself is solid too. Prices have been creeping up over the years, but so has the quality. The watch is unique and I get lots of questions and complements about my CW Watches. As I said in the first line of this review (5000 words ago!) which watch you buy and wear and love is a personal decision. 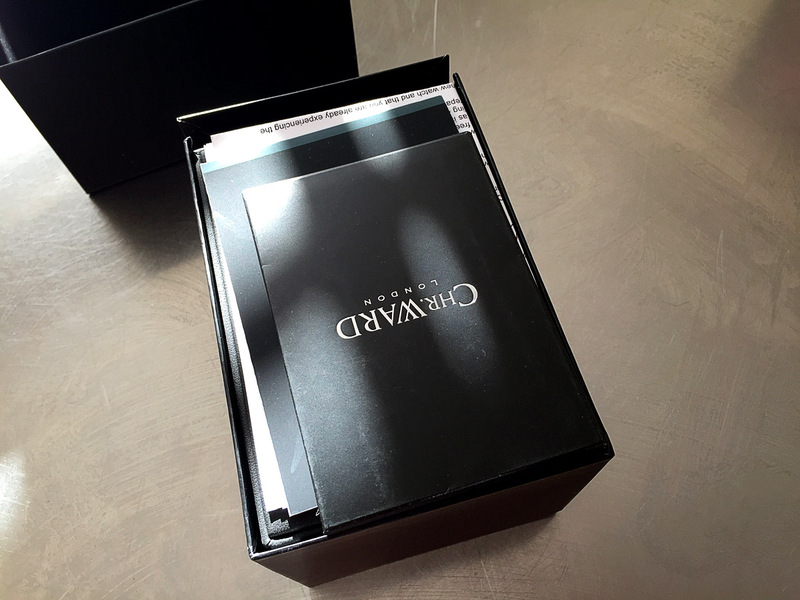 Buying unseen from the web may appear to be slightly frightening and I hope to have been able to show you the positives and negatives regarding the CWL C60 Pro 600. 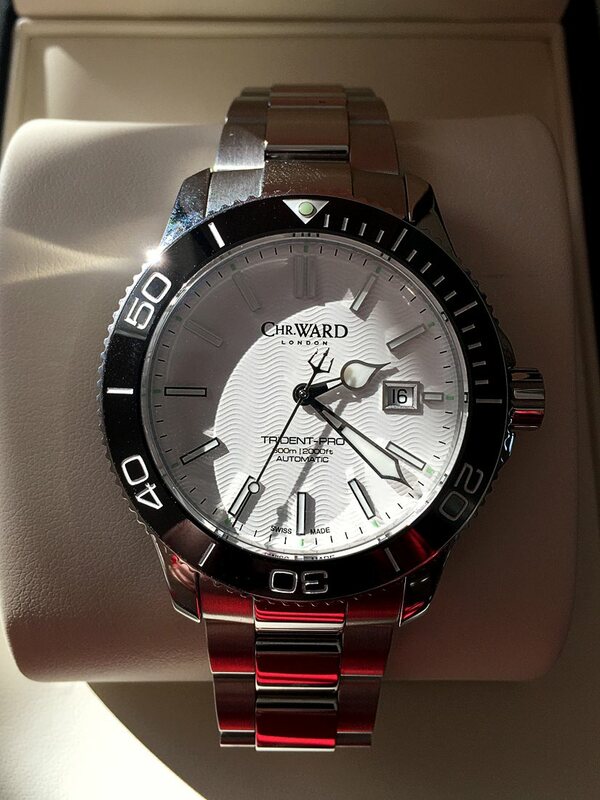 I think it is an excellent watch indeed, a real upgrade from the previous model, which was also excellent, and a new standard for others to reach for. Buying from CWL is to enter into a relationship with a company very much in touch with its customers. 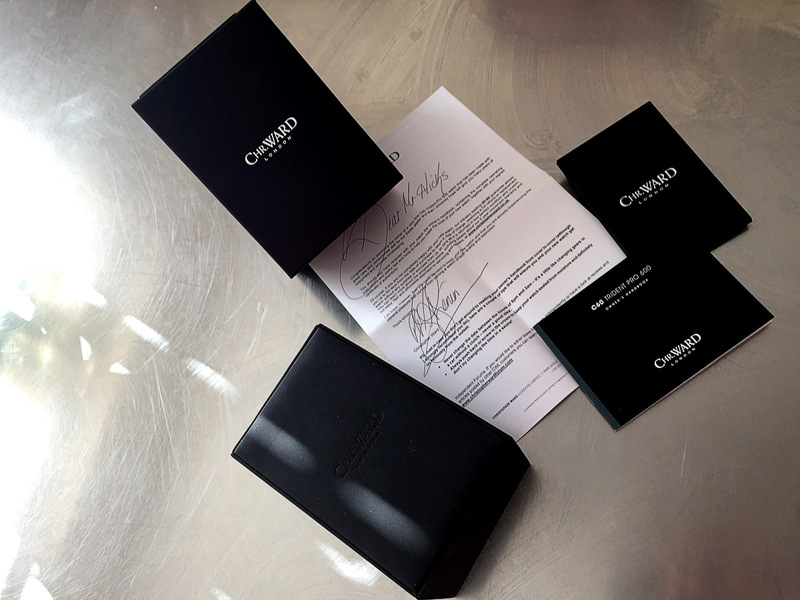 Either through the personal contact with the company people, through the excellent response times on things – seriously, compared to some like MKII and Steinhart, who ignore their clients a lot of the time then CWL are incredible – to the 60 day send back guarantee. I feel that buying a CWL is a safe bet. They hold their value, they work excellently well and you will get all the support you could want. That’s a solid endorsement from me, but then I am not a celebrity so that’s OK! PS. If you have any questions please feel free to put them in the comments and also, please share this article if you liked it! 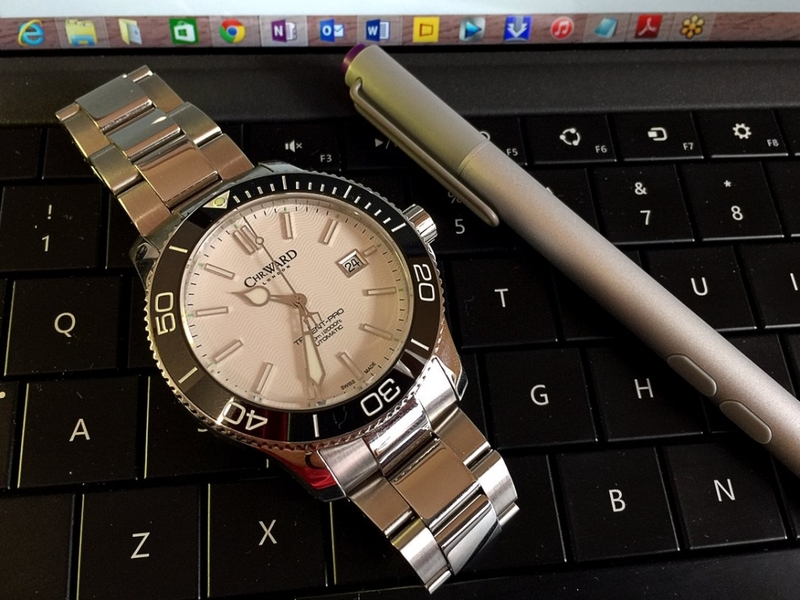 A proper diving watch for people who dive. May not suit very thin wristed men. I believe this is the best time to consider a CWL watch.